This guest post was written by Aurora Klæboe Berg, VP of Business and Marketing at Dirtybit, a two year old indie gaming studio based in Norway. Dirtybit has launched two games: Drop the Box and Fun Run, and is currently working on an upcoming title. Tips and tricks that indie developers should follow in order to build and market their games can be found everywhere — but surprisingly few of them can be checked off if I review Fun Run‘s marketing strategy. Apart from the concept (real-time multiplayer game with the shock effect of killing cute forest animals), there was no reason, in terms of the normal do’s, for Fun Run to amass a user base of over 30 million: inviting friends into the game is difficult (no Facebook friends integration), the game offers no direct link to social media platforms, the game’s visuals clearly scream student project, the game does not make use of push notifications, the game was not marketed, we did not spend anything on paid user acquisition, we had no analytics infrastructure, we didn’t use a publisher — the list can go on forever. So how did Fun Run manage to climb all the way to the top of the App Store’s download charts? Why have more than 30 million users downloaded the game and celebrated it with more than 200,000 pictures on Instagram? What did we do that made it possible to market the game for $0? 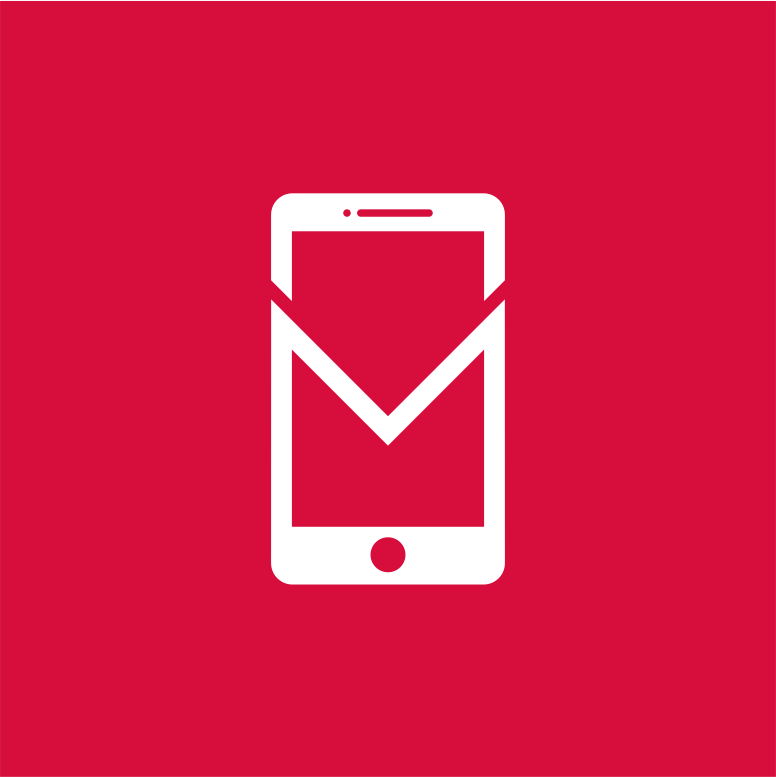 In this guest post for Mobile Dev Memo, I’ll describe a few of our do’s that will hopefully help other indies reach the top of the charts with small budgets. There were no big synchronous multiplayer games out on the mobile market when Fun Run launched. Fun Run was created when the Dirtybit founders tried to reinvent their fun childhood experience of Mario Kart together with their friends, combined with Happy Three Friends and Sonic. 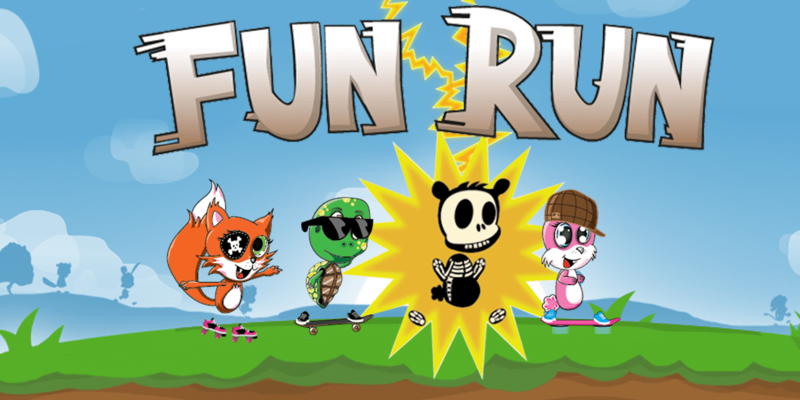 Fun Run introduces both a different type of game and a new technology for the mobile market. It’s important to choose a catchy name when creating a new game. Try to choose a name based on words that can rhyme, start with the same letter, and shouldn’t be too long. Fun Run is both short, catchy and rhymes. There were other apps titled Fun Run at the time of launch, but none with a scary user base. Early on, we created both a Twitter account and Facebook page for Fun Run. We were able to communicate all our updates to our players using these channels from the very start, and we also used them to remind fans to play the game. This was essential in growing the user base. It’s also easier for users to reach out through social media when they have an issue. Fun Run was launched September 5th, 2012, but it wasn’t until November 25th — when we started our Twitter campaign — that things started to pick up. We asked users to tweet their username and #funrun for a chance to win 10,000 in-game coins. The competition resulted in 2x more downloads that day, and users started to recruit their friends using #funrun on social media platforms like Twitter and Instagram. 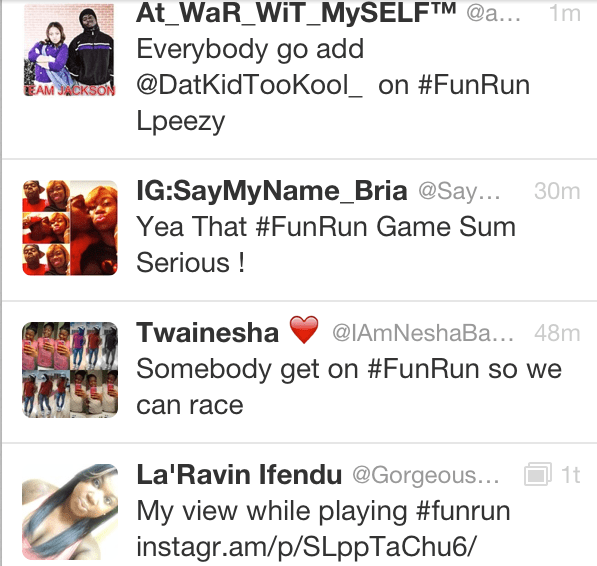 The usage of #funrun increased every day; in fact, it actually resulted in #funrun trending worldwide on Twitter! This was almost too good to be true. New tweets showed up every minute, and the game quickly started to climb on the Apple App Stores rankings. December 11th 2012 (a year ago, tomorrow!) 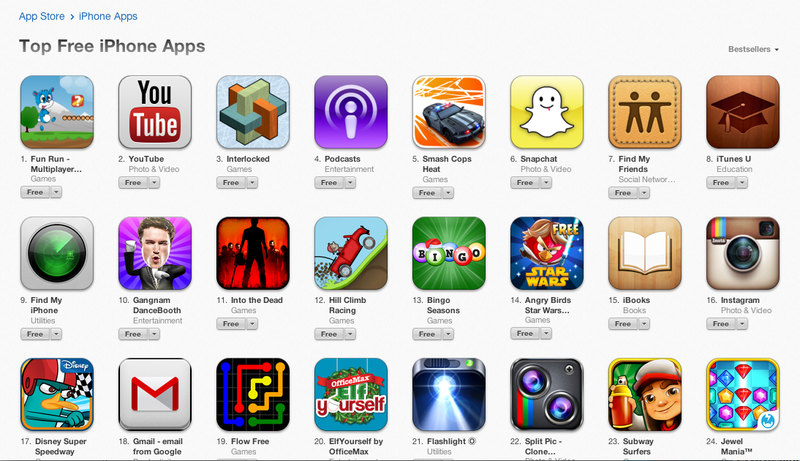 the app reached the sweet #1 spot on the App Store in the US and we were a “Top 5” app for a whole month! Make the game public/visible to others. Create a game that the users will sell for you. 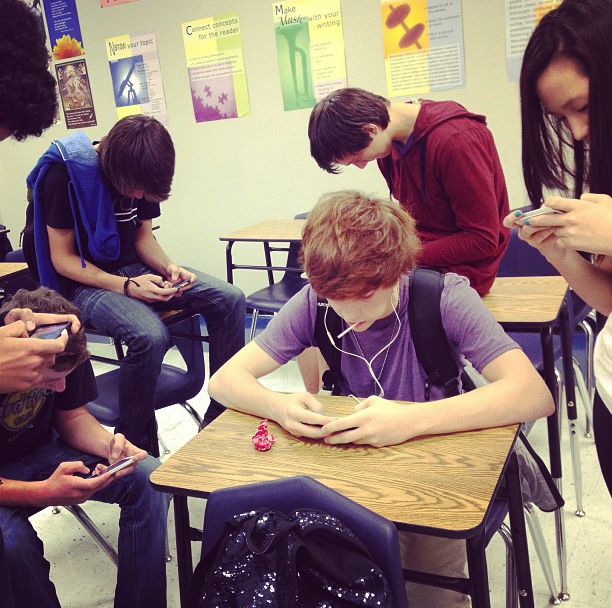 Most of our players prefer to enjoy a game of Fun Run with their friends. They scream and shout out loud when they win or lose, creating a curious audience. Make your users recruit their friends in a non-nagging way. We all know that we’re more likely to adapt to what our friends acknowledge than what an advertisement does. Since launch, we’ve tried to add new content and bug fixes on 3-5 week cycles. The users get a reminder whenever there’s a new update, which increase retention. A lot of experts are talking about timing. The strategy behind Fun Run’s timing is three fold: the Twitter campaign, high school students exams, and Christmas were all important to the rapid growth that we experienced. Without the critical mass of about 1,500 new downloads a day (300,000 downloads total at the time of the Twitter campaign), it would probably not have had the same effect. High school students trying to find things to do while procrastinating between their exam studies were helpful, too. It’s also important to update the app before Christmas due to a lot of people getting new devices that they want to fill with new apps. Create a consistent name on social media platforms. Today, a year since we ranked as #1 on the US App Store, we are experiencing increased traction again. US High School kids are emailing us about their mission: to bring Fun Run back! That’s why we’re launching Fun Run 2.0 today. Maybe we can make #1 again, still with a $0 marketing budget? Download Fun Run from the Apple App Store, Google Play, the or Amazon Appstore and get addicted today!